THE CURE FOR ALCOHOLISM delivers exactly what millions of alcoholics and families of alcoholics have been hoping for: a painless, dignified and medically proven cure for their addiction. Backed by more than 70 clinical trials and research that extends back to 1964, the Sinclair Method deploys an opiate blocking medication in a very specific way—in combination with ongoing drinking—to extinguish the addictive “software” in the brain. The de-addiction process literally rolls back the addictive mechanism in the brain to its original pre-addicted state—before the first drink was consumed—making this program an actual cure for alcoholism. Included in those millions is Claudia Christian, Hollywood actress and one of the stars of Babylon 5. Her book, Babylon Confidential, details how The Sinclair Method helped her overcome her addiction that she had depended on to cope with the difficulty of her sad life in the fast lane. Drs. 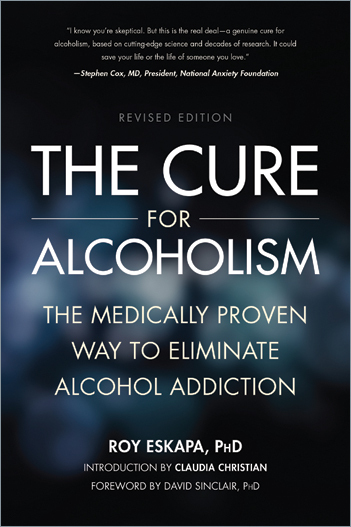 Roy Eskapa and David Sinclair of The Sinclair Method have put together a sound scientific book that proves that alcoholism can be cured in more than 78 percent of patients with this particular method. What’s more, the treatment avoids the dangerous withdrawal symptoms, allowing patients to detox gradually and safely while they are still drinking. This removes the need for expensive and unpleasant inpatient rehabilitation programs. Actual drinking levels and cravings automatically decrease until control over alcohol is restored. The bottom line is that patients can control their drinking or stop altogether with the simple yet powerful process outlined in The Cure for Alcoholism. THE CURE FOR ALCOHOLISM is a revolutionary book for anyone who wants to gain control over his/her drinking. Finally, there is a cure for alcoholism. This book is the first step. Excerpt pp 93-99: Self-Assessment—Do I Need Help? Roy D. Eskapa, PhD, obtained a BA in psychology from Reed College in Portland, Oregon, and went on to complete a PhD in clinical psychology at the California School of Professional Psychology, in Los Angeles. He had a variety of postdoctoral training experiences including forensic psychology, multimodal therapy, and addiction medicine. He has published several articles and book chapters as well as a 400-page tome on forensic psychology. During the 1990s, he developed a successful program for treating childhood enuresis while also working closely with Dr. David Sinclair on his research into pharmacological extinction (Sinclair Method) into the causes and solutions for alcoholism.He is an Associate Fellow of the British Psychological Society and is a Chartered psychologist in the UK. At present he is focused on securing greater exposure for the unequivocally cost-effective Sinclair Method in the treatment of alcoholism and other drug addictions. In addition to conducting a private one-to-one and online practice, Dr. Eskapa is available for speaking engagements and consultation to industry, government health and education departments, and NGOs on Sinclair’s revolutionary prevention of and cure for alcoholism and other addictions. David Sinclair, PhD, began research on the causes of alcohol drinking as a University of Cincinnati undergraduate. Among his discoveries was the Alcohol Deprivation Effect (ADE)—now widely recognized by addiction medicine as a central to explaining why the vast majority of alcoholics relapse after traditional abstinence-based treatments. In other words, weeks of forced abstinence—as used in conventional detoxification and detention treatments—instead of being beneficial, actually increase alcohol craving. After getting his doctorate in 1972 from the University of Oregon on the ADE, Dr. Sinclair immediately went to Helsinki to work at Alko Laboratories (now part of Finland’s National Public Health Institute)—probably the best place in the world for finding a better treatment for alcoholism. His solution, pharmacological extinction, became apparent only after he wrote The Rest Principle: A Neurophysiological Theory of Behavior, a book showing how the nervous system strengthens behaviors that stop hunger, thirst, pain, or release endorphins, and extinguishes behaviors that no longer produce reinforcement. He subsequently worked on the clinical trials proving the concept and practical implementation of the treatment in real patients. He is currently researching extensions of the treatment for alcoholism to other addictions, and on a new treatment for panic disorders.